Our award-winning Community Grants program supports projects that give special consideration to working families of modest means. Freedom First supports the efforts of Community Action Agencies to break down barriers, enable people to fully participate as local citizens, and help families achieve economic success and a better quality of life. Our 2018 community grants cycle is now closed. We will announce the winners once they have been selected. Please keep an eye out for announcements about the next cycle in the summer of 2019. Download the follow-up form for 2018. Activities, programs, and initiatives designed to improve the economic well-being of our local community and its citizens. Examples include poverty reduction, affordable housing, and financial education. Activities, programs, and initiatives that contribute to an individual’s functioning in the local community addresses or prevents the onset of social, psychological, or physical problems or disabilities; or extends an individual’s ability to be independent or productive in our local community. Activities, programs, and initiatives that increase access to and promotion of the arts and the development and enhancement of cultural identities in the local community. Examples include arts programs, diversity initiatives, and cultural events. For more information, contact our Community Development Team below. 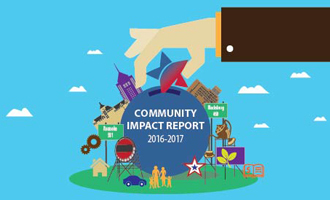 In 2016-2017, Freedom First awarded $60,000 in Community Investment Grants and contributed $201,906 in community investment through event sponsorships. $108,541 was spent in 2018 through event sponsorships. Freedom First awarded $35,000 in annual Community Grants in 2018 to support the vital programs offered by seven local nonprofit agencies. Blue Ridge Literacy $5,000 Blue Ridge Literacy plans on using the grant funds as part of a budget designed to support citizenship instructors and staff, supply resources for volunteer trainings, augment outreach efforts through video and social media, and purchase materials. Children's Museum of Blacksburg $5,000 The Children's Museum of Blacksburg plans to utilize the grant funds to directly subsidize the cost of transportation via public school buses for low-income students enrolled in Title 1 schools throughout the NRV to and from the museum. LovABLE Services $5,000 LovABLE Services plans on utilizing the grant funds to complete the development of their comprehensive training program by providing support staff to train new employees and purchase specialized food service training equipment needed to train people with special abilities. Mill Mountain Playhouse Co (Mill Mountain Theatre) $2,500 Mill Mountain Theatre will be utilizing the grant proceeds for a proven program that builds literacy skills and interest in reading for children who see their Young Audiences performances by purchasing and distributing books given to children who attend those shows as well as residencies in classrooms of schools that area educators identify as poor readers. NRV Agency on Aging $4,500 The grant funds will allow NRVAA to hire a home health aide from an approved agency to stay in the senior household as the caregiver takes a needed break to rest and complete necessary errands that they would not otherwise be able. Prevention Council of Roanoke County $3,000 The proceeds for the grant will allow the The Prevention Council to grow their community outreach through education for parents, grandparents and adult caregivers through extensive importance of safety when allowing children, pre-teens and teens to possess and use daily phones and other electronic devices by purchasing supplies and printed materials for workshops, covering staff time and mileage and off-setting participant fees. STEP, Inc. $5,000 The grant funds will allow STEP to hire one part-time staff position to manage the Volunteer Income Tax Assistance (VITA), a program offered through collaborative, community partnerships to educate people about the importance of proactive financial management and self-sufficiency. Turn the Page, Inc $5,000 The grants funds will allow Turn The Page to continue their “Books and Breakfast” program, which provides a hot breakfast and free books to families of students at Hurt Park Elementary and Westside Elementary, by funding program costs to include food, books and buses to transport families who may have a need for transportation. 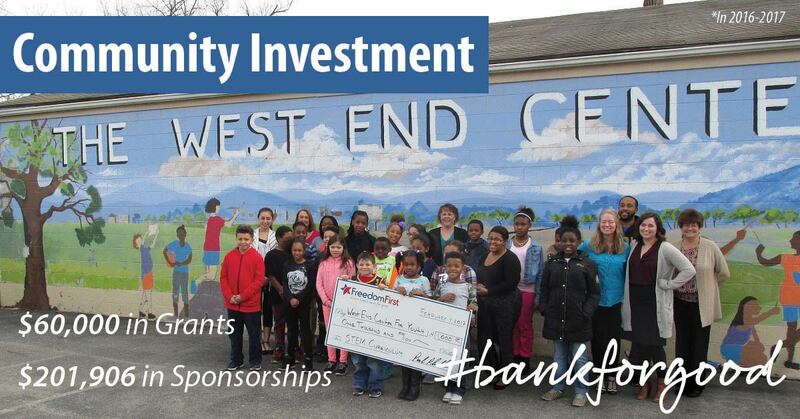 Learn about our Community Investment Grants from Tim Cerebe. Did You Know? Freedom First's ice cream truck Scoop gave out 52,000 free ice creams in two years at local community events.